A friend was going through family papers. Her parents died several years ago, and she had put off this chore until now. In the mix of tax papers, warrantees and all the other remains of their lives, she came across a box of letters that her father had written to her mother during WWII. The letters were intimate while at the same time brutally honest about his feelings about being a soldier. She was shocked and disturbed by some of the things he wrote. When she and I spoke, she was contemplating destroying the letters so that no one else in her family would be burdened by what the letters contained. Secrets and lies have stitched together a narrative that is United States history. Every generation has the opportunity to continue the pattern or pull the stitches and begin again. So far, each generation has selectively repaired the stitching while keeping the pattern in place. The more selective the repairs, the more absurd the whole appears to any outside observer. Yet we stitch on. The day before this conversation, I had tea with another friend who is twenty years younger than I am. He and I talked about our experience of prior generations. We both recognized a gap between the socially acceptable versions of each generation’s narrative and our own experience of them. 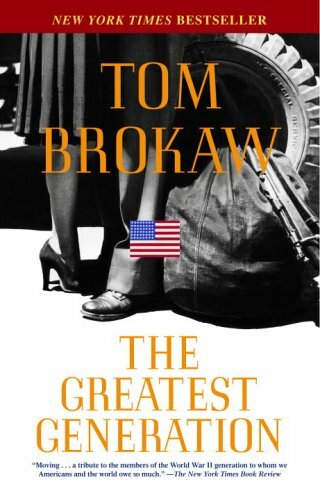 For example, Tom Brokaw coined the phrase “The Greatest Generation” to describe the men and women who were adults during WWII. But our fathers kept silent about the internal ravages of that war, and took their rage out on their wives, sons and daughters. We have life-long scars to show for it. The story of the “greatest generation” is also a story of physical abuse, alcoholism, drug dependency, sexual abuse, and, perhaps most of all, shame. Unfortunately, many of us caried the tragedy of that generation into the future. Thinking we were making things better by not being like our parents, we raised a generation of self-centered, pampered children who refused to grow up long after it was time. Of course, that cycle wasn’t born with our parents, either. It was a legacy handed down to them. One of the marks of American culture is the sanitization of our histories, personal and collective. We only speak about the things that make us appear to be “winners” or normal. 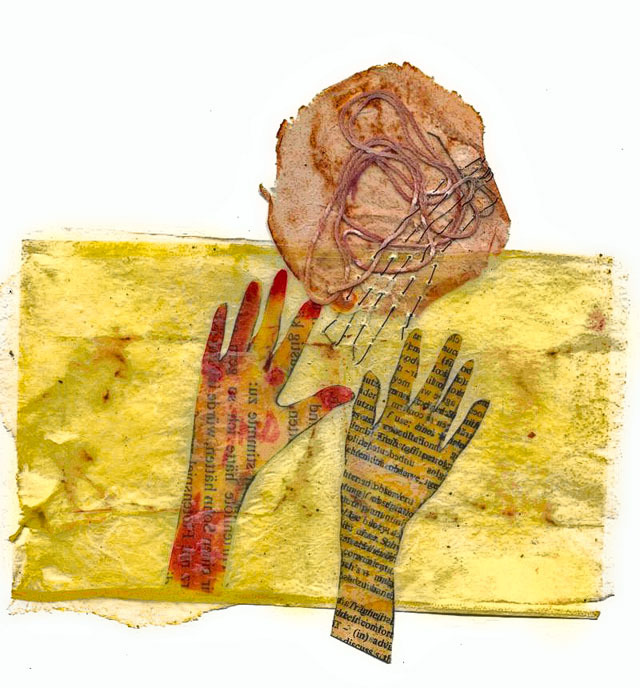 We hide or choose to ignore the sectors of our personalities that have blemishes. This is particularly true of our relationship to our offspring. Children believe us when we set standards. In their beautiful innocence, they are immediately and viscerally affected by our hypocrisies. By asking them to pretend those hypocrisies don’t exist, we ask them to lie for us. And so we draw them into our own insanity. Then they ask their offspring to do the same and so on. My generation, the Boomers, had our moment to change the pattern. The majority of boys/men from our generation were mandatory conscripts into the military. Except for great wealth, only health and education status could exempt them. Once they returned, waves of people began questioning what they were giving their lives for. What was so precious in this little Asian country that required them to die or take another’s life? We know now that it was all a sham, but in the moment there were no answers, only looming, life-altering questions. WWII veterans came home and kept silent because their stories would debunk the myth of fearless heroism. Vietnam veterans came home and kept silent because the culture didn’t want to hear about deeds done in our name, at our collective behest. Since the only options of war were win or loss, we chalked that one up in the loss column. Everybody associated with it was a loser. This pattern has been handed down ad infinitum since the beginning of US history. It’s why we have Southerners who want to defend their ancestors and Northerners who have a hubristic sense of arrogant, self-righteous virtue. We are locked in perpetual childhood. We avert our eyes and insist we couldn’t have broken the cookie jar. Generation after generation we perpetuate the lie of our collective innocence and hence goodness. Each generation tells the next about our unblemished moral virginity. Each sets a standard that is both unrealistic and unattainable. 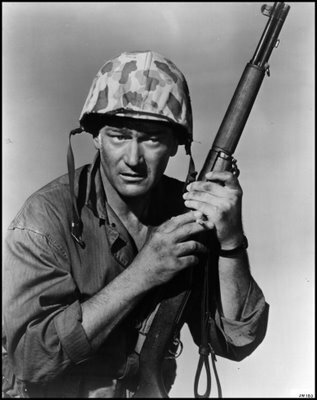 If my parents’ generation had been honest, then my generation wouldn’t have believed the John Wayne mythology. We would have seen war for what it truly is: violent, soul-destroying murder in support of a cause. Our parents would have taken the time required to decide the merits of the cause before sending their sons off to have their psyches permanently altered. Rather than marginalizing the boys/men who refused to fight in Vietnam, their fathers would have been able to frankly and honestly help them assess their position and then support them on their decision. The man. The myth. The B.S. We also would have known that our parents’ generation of women had the highest rate of pre-marital pregnancy ever. But that statistic was disguised by a rash of shotgun weddings followed by “premature” births resulting in a lot of angry men and women tied together only by obligation. The mothers who insisted we maintain our virginity until after marriage hadn’t lived by that standard themselves, and the marriages they entered into were often brutal and cruel. My generation saw the cruelty and decided the problem was the institution of marriage. So, we either avoided it as long as possible or determined that our marriages would be based on this mystical thing called “love” that had clearly been missing between our parents. We also decided that when things got uncomfortable or difficult we would rather end marriages than stay in an institution that didn’t fulfill our individual needs. Where there were children involved, we convinced ourselves that they would want exactly what we believed we had wanted in our childhood: parents to get away from one another and just stop the arguing and tension. The most popular cure became divorce. We tried other cures: secret affairs, open marriage, communal living. None of them worked. All of them took a toll on the next generation. We exchanged the insanity-laced security our parents provided us with insanity-laced insecurity for our children. Now newer generations struggle with the consequences of our choices. We have neglected to tell them the true stories of our life experiences. We have left it completely up to them, to make it up as they go. Our responsibility as human beings is to tell those stories. Those stories are what liberate each generation to live authentically. Those stories provide them with guidance and cautionary roadblocks. Let me give an example. The first European colonists to this continent believed that the people who already inhabited it had no religion, no culture, and no intellect. They used that as justification to take their land, their languages, and destroy their way of life. We have continued that paradigm as national policy toward indigenous people in the Americas as recently as the 1980s. In some parts of those continents we continue the policy of putting our national economic and military might behind those who are “cultured,” even when they are bullies and despots without a single, evident drop of care for ethical governance. Pinochet in Chile. Batista in Cuba. Rios Montt in Guatemala. The list is long. Let’s bring this closer to home. The parties led by Luther Collins and Arthur Denny are heralded as being Seattle’s first European settlers in 1851, five generations ago. Within less than a generation, they and their descendants had driven the indigenous people of Puget Sound out of the area. Until 1968, racial deed restrictions forbade persons of color (whether Asian, African American, Pacific Island, Latino, etc.) from living in almost every neighborhood in Seattle. If you are descendant from a white family that bought a house during that period, your ancestors signed a mortgage document including language that explicitly forbade them from ever selling that property to a person of color. If your parents or grandparents still own the home, you might want to ask to see their original mortgage documents. Coded language was created to talk about this forced division: good schools, bad neighborhoods. There was no need to mention that the schools were good because all the resources for over 100 years were funneled to schools in white neighborhoods. Or that the neighborhoods were bad because whites held the keys to the economy and the residents couldn’t get jobs that would allow them to live beyond subsistence, or because trash pick-up, road repair and other municipal services were provided in a slap-dash manner. Layer by layer, the mythology of white superiority was reinforced while people of color lived in economic thrall. Society had put all of its eggs into one basket and the holders of that basket got to choose how many eggs could be sent into any other baskets. 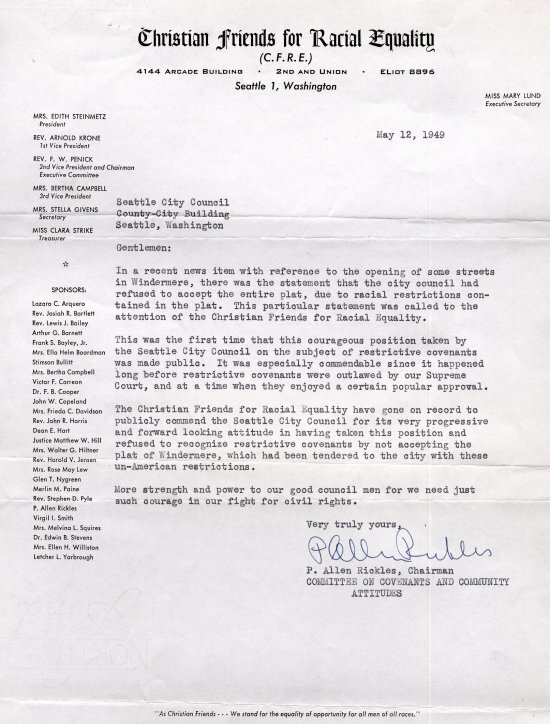 Christian Friends for Racial Equality on restrictive covenants in Seattle. The 1968 Housing Rights Act legally removed policies that kept housing segregated, but studies done as recently as 2011 in Seattle show that informal practices by developers, realtors, and landlords who use coded language and filtering to exclude persist. In 2000 Washington voters outlawed affirmative action, allowing the eggs to go back into the dominant basket. Thirty-two years were allotted to repair the damage done over the past one hundred fifty. This is just one example of how a lie told generations ago impacts generations of the present day. If we have the wrong analysis, we create solutions that won’t work. It’s like having a persistent headache and taking aspirin without asking whether or not there could be other factors (caffeine, concussion, tumor, migraine, stroke). To my peers who are over 50 years old: Stop telling the stories of the “good old days” in Seattle. Tell the truth, all of it. Unvarnished. Were they good old days for you? Fabulous, but be honest about what it cost you or others to achieve those “good old days.” Were there people without the same opportunities you had? Talk about the challenges you faced, whether you overcame them or not. Talk about the things that failed, and why. Otherwise the generations that hear your stories will believe that success is achievable without struggle and will be deflated by their own challenges. Talk about the beliefs you held in your youth and why you have sustained or abandoned them. Give specific examples of the events that have gone into making your life’s decisions. A daughter needs to know that her mother’s defensive attitude towards boys/men comes from having been raped in college or lied to by significant men in her life. A son needs to know that his father’s argumentative attitude comes from having been told over and over again in childhood that he would never amount to anything. Children need to know their mother works all the overtime she can get because she once failed at her first job and was homeless for a year before they were ever born. Talk about your job joys and frustrations. Tell them why you’re not the famous musician you dreamed of being when you were seventeen. (Do they even know you had that dream?). These vulnerabilities will enable them to see us, and therefore themselves, in a new light. If you can’t do that for the generations directly in your care, then ask someone else to step in and serve as the truth teller: another family member, a mentor, a counselor. Now to those of you under 50: Ask us about our failures. Ask us what went wrong in our lives as well as what went right. Don’t let us give you the pretty, sugar-coated version of our lives. Demand to know where the crevasses are in the mountains that we’ve climbed, or the low spots where our journey derailed or stopped. We need to tell you those stories as much as you need to hear them. For both individuals and societies, life is like a cylinder. We come around full circle eventually, but we have the option of having learned enough to reach another level up the cylinder. We’ve done it in some aspects of our history (e.g. : when I was growing up Chinese food was considered exotic, now nothing is). If our eyes are open, we have the opportunity to see that our current personal and social systems are producing chaos and adding layers of dysfunction. We can change this, but we’ve got to go back and unravel the threads at the point where things went askance. For our North American culture, that takes us back to the beginning. Until we tell the truth, the whole truth, we cannot have real reconciliation nor create a healthy, functional, just society.